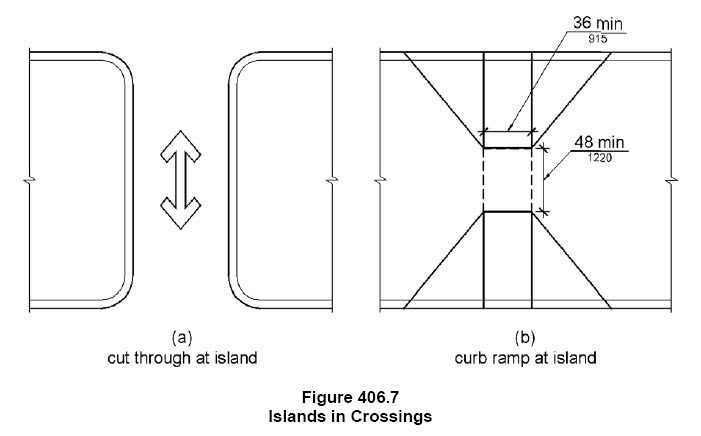 The 1991 ADAAG required that all exits that served as a means of egress as defined in the IBC be accessible. 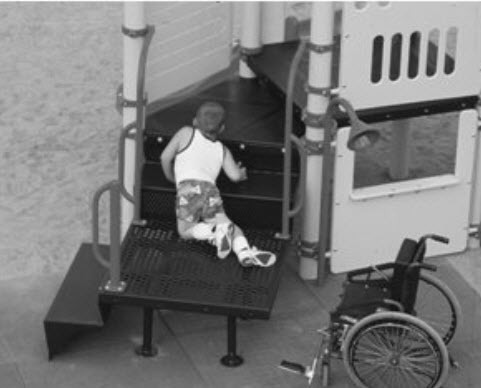 the 2010 ADA Standards no longer scopes how many means of egress must be accessible, but it refers to the 2003 IBC edition or 2000 IBC edition with 2001 supplement for the accessible means of egress requirements. 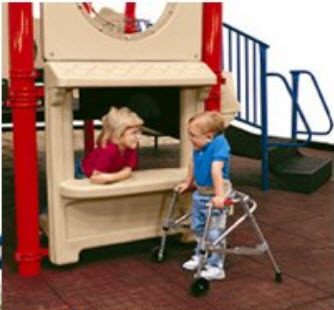 Typically, the IBC requires, if there is one means of egress it must be accessible. 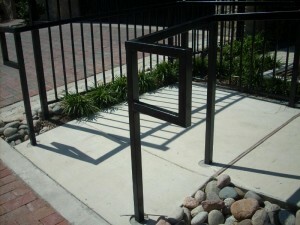 If there are two or more means of egress, then two accessible means of egress are required. 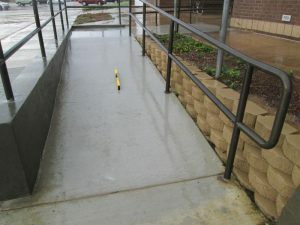 Although the ADA Standards do not have specific requirements for accessible means of egress, it references the IBC and adopts their requirements. 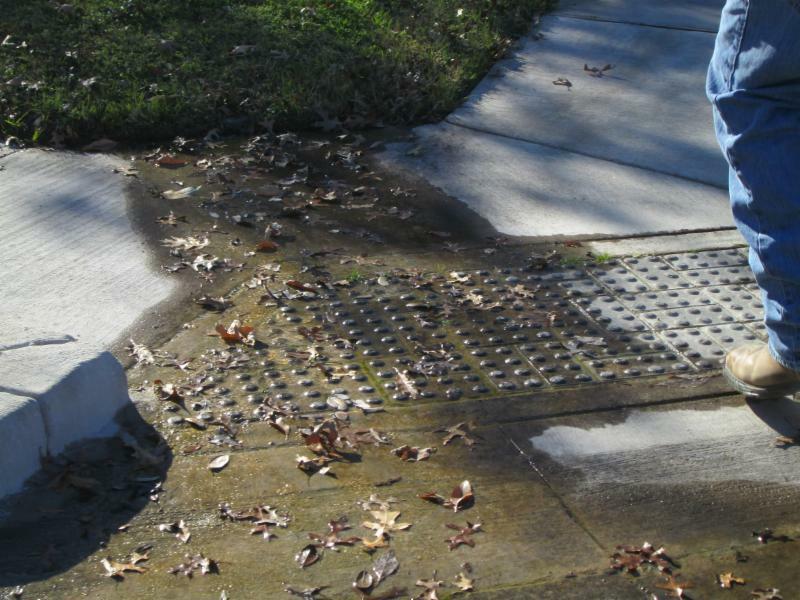 This newsletter will explain where the IBC ends and the ADA begins when determining the means of egress requirements. 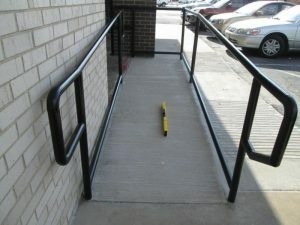 An accessible means of egress, according to the IBC, is a “continuous and unobstructed way of egress travel from any point in a building or facility that provides an accessible route to an area of refuge, a horizontal exit, or a public way. 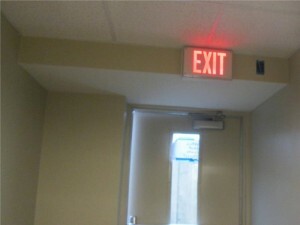 Exit access is any path from any location in a building to an exit. 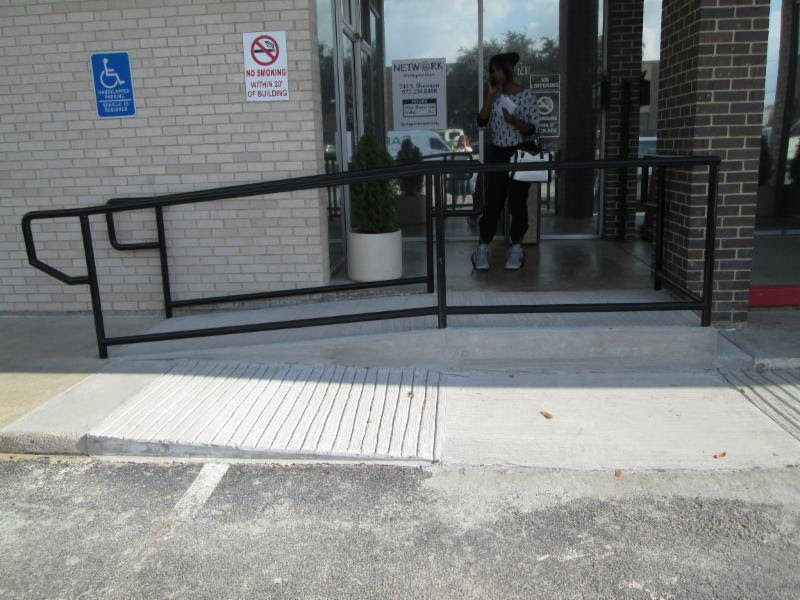 Although we must follow what the IBC dictates on the means of egress requirements, an exit access in the ADA cannot be less than 36″ wide. The IBC typically requires it to be wider (48″ min). 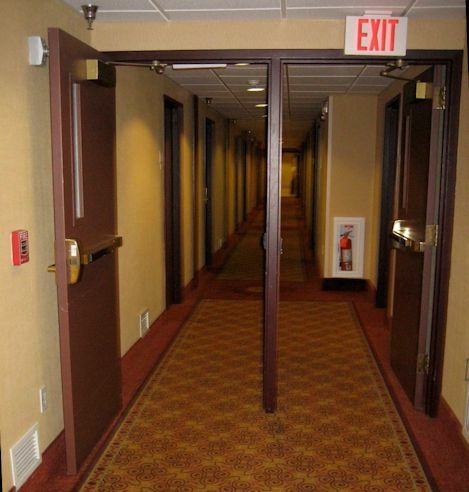 Exits include doors to the outside, enclosed exit stairways or horizontal exits. The ADA requires that doors used to pass through a space to the exit meet the guidelines of section 404. 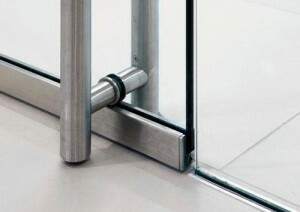 Those guidelines require maneuvering clearances, door hardware, opening force and closing speed to comply. 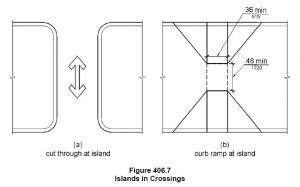 Means of egress doors could include doors into exit stairwell, doors leading to exterior exits or doors leading to exit corridors just to name a few. 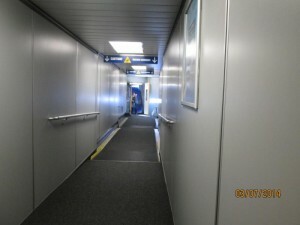 This exit door had a push side approach with both a closer and a latch. The maneuvering was a forward approach, and the door was recessed more than 8″, therefore it required a 12″ additional space on the latch side (even though it was a means of egress door). 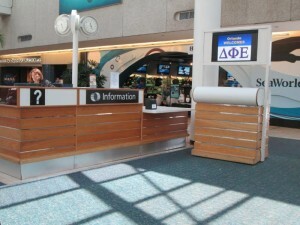 An exit discharge is the path from an exit to a public way (i.e. street or alley). 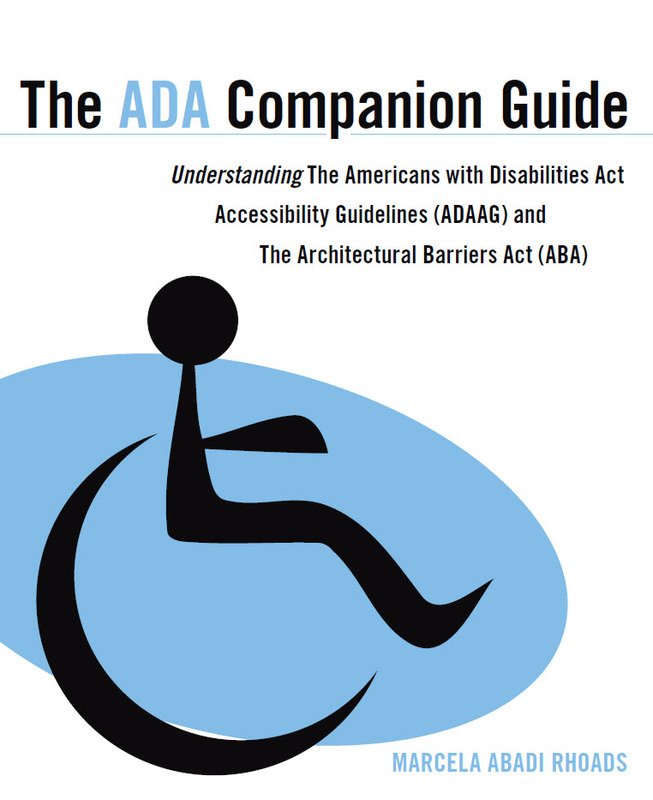 The ADA does not have guidelines directly relating to an exit discharge. Exit discharged are scoped by reference. Assisted rescue including area of refuge are not scoped in the ADA, but may be in the IBC depending on whether the building is sprinklered or not. 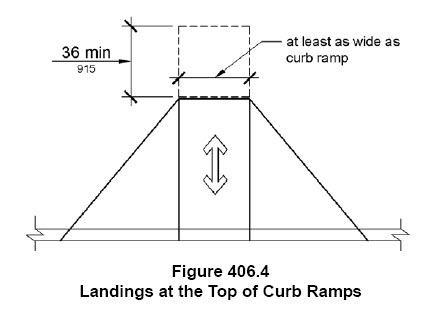 If there are any new stairs on the exterior or interior that are part of the means of egress, they must follow the guidelines on section 504 and 505. 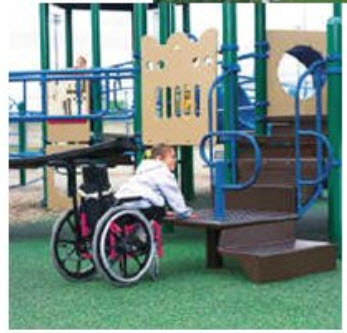 Whereas the IBC will focus on the number of stairs required, including the width etc, the ADA focuses on the walking surface inclusing the depth of threads and height of risers, and whether the stair treads have nosings. 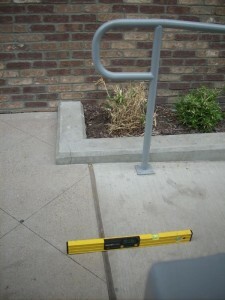 The ADA will also give guidelines on the handrails heights, size, shape and continuity. 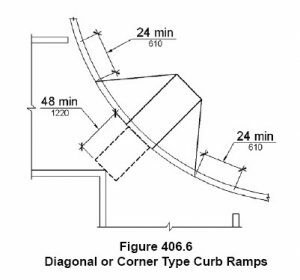 The ADA section 216.4 sets guidelines for exit doors, area of refuge, and directional signs that provide directions to accessible means of egress. 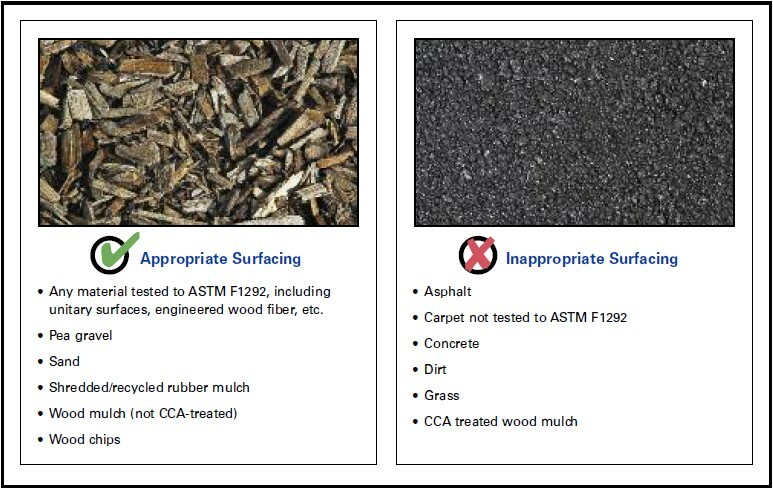 These signs must not only comply with the ADA sections 703 but also the IBC sections specified in the Standards. Means of egress signs should have raised characters and visual characters with a certain size, depth, case, style and proportions all found in ADA section 703.2 and 703.5 If the visual characters are accompanied by braille that complies with ADA 703.3, then the visual characters provided do not have to have a specific case, style, height, proportions, height, or spacing. Curb ramp connects access aisle to the accessible route to the accessible entrance of the polling places. 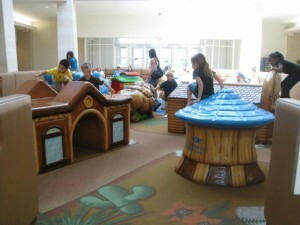 Note: A turning space should also be provided. If there are deaf voters who need assistance, the blinds should be closed behind the check-in so voters who read lips can communicate with the voting staff. Everyone should go to their polling places and make sure there are facilities that are accessible for voters in wheelchairs, voters who are visually impaired as well as hearing impaired. Let’s try and make this election an accessible one. What is the deal with accessible swimming pools? They must be located in an area shallower than 48″ deep. 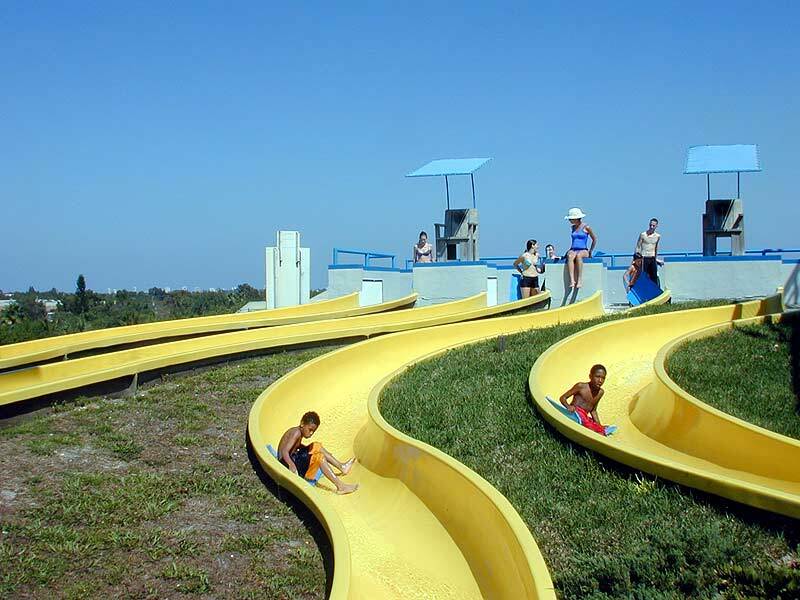 If the entire pool is deeper than 48″ then location is not dictated and it can go anywhere. 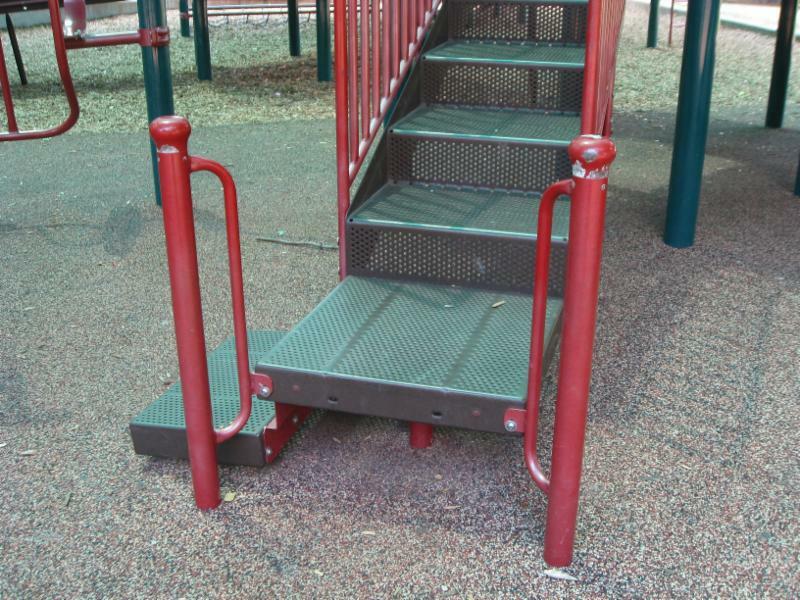 They are just like ramps, but do not require slip resistant surface or handrail extensions. They should only go as deep as 30″ below the water level. 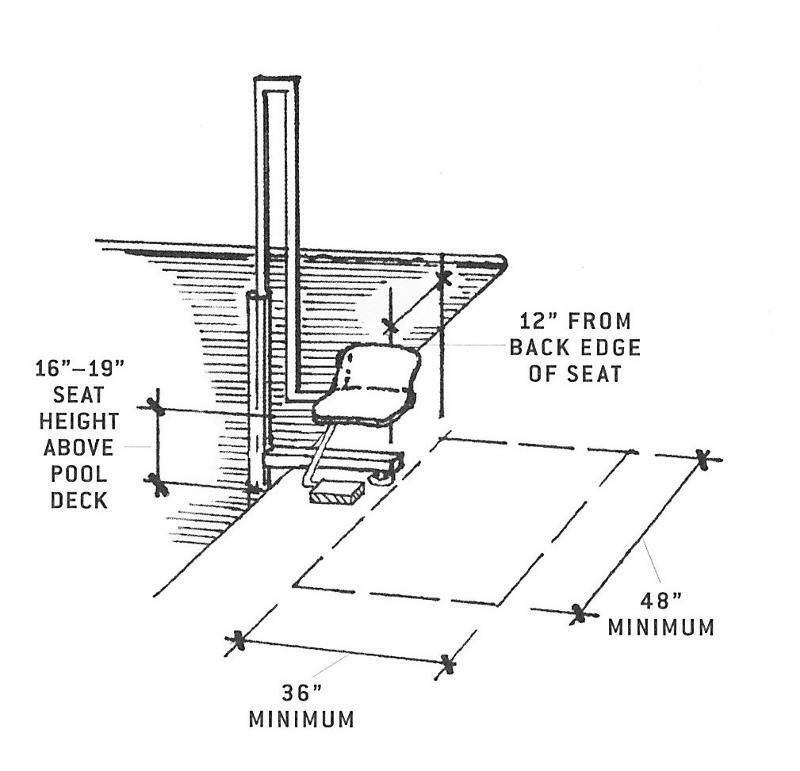 If the pool is deeper, a platform at 30″ that is 5′-0″ wide should be provided. The sloped entry does not extend beyond that. 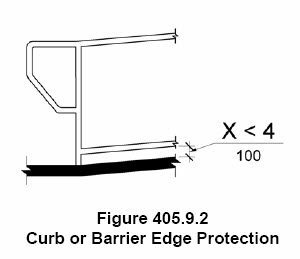 If the pool is larger than 300 linear feet of pool wall, then two means of entry should be provided. 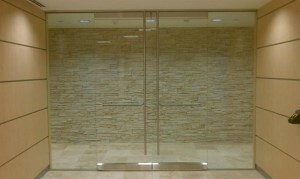 At least one of the means of entry should be a lift or a sloped entry. 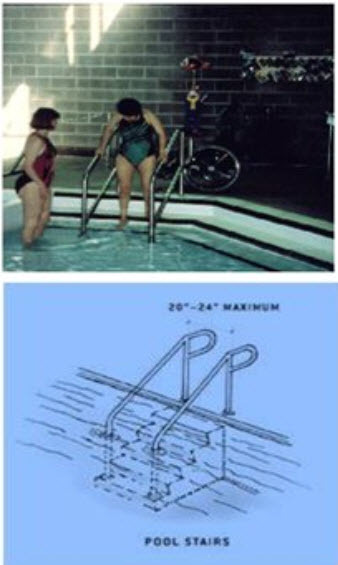 Wave action pools, leisure rivers, sand bottom pools, and other pools where access to the water is limited to one area and where everyone gets in and out at the same place, must provide at least one accessible means of entry, no matter how many linear feet of pool wall is provided. 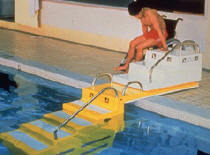 The accessible means of entry can be either a pool lift, sloped entry, or transfer system. 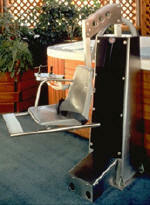 Spas must provide at least one accessible means of entry, which can be a pool lift, transfer wall, or transfer system. If spas are provided in a cluster, 5 percent of the total-or at least one spa-must be accessible. If there is more than one cluster, one spa or 5 percent per cluster must be accessible. Since swimming pools were not required to be accessible in the 1991 ADAAG, this brand new requirement applies to new construction that occurs after the mandatory date of March 15, 2012. But the DOJ also required that existing facilities be brought up to compliance “as it is readily achievable”. What this means is that means is that compliance should be achieved without much effort and expense. For existing facilities with swimming pools, what this means is that the means of entry should be provided if there is enough money and if it does not cause undue burden for the building owner. These terms are very subjective and they must be backed up with financial proof. 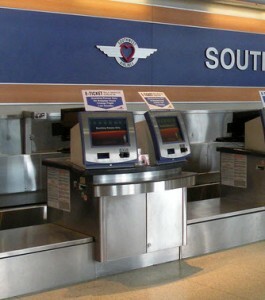 Many members of the hospitality industry were concerned about these new requirements, and therefore the DOJ gave an extension until January 31, 2013 to comply with these requirements. My colleague Ken Otten wrote a great blog about it. I recommend that you read it to gain a better understanding of this ruling. Is the accessibility of your business good business? This guest blog is brought to you by my friend William J. Martin, WJM Architect (photo credit Mike Pollio). I met William on Twitter and have been following his amazing work for over two years. He is amazing and I’m grateful and flattered that he decided to write a blog post for our site. Enjoy! 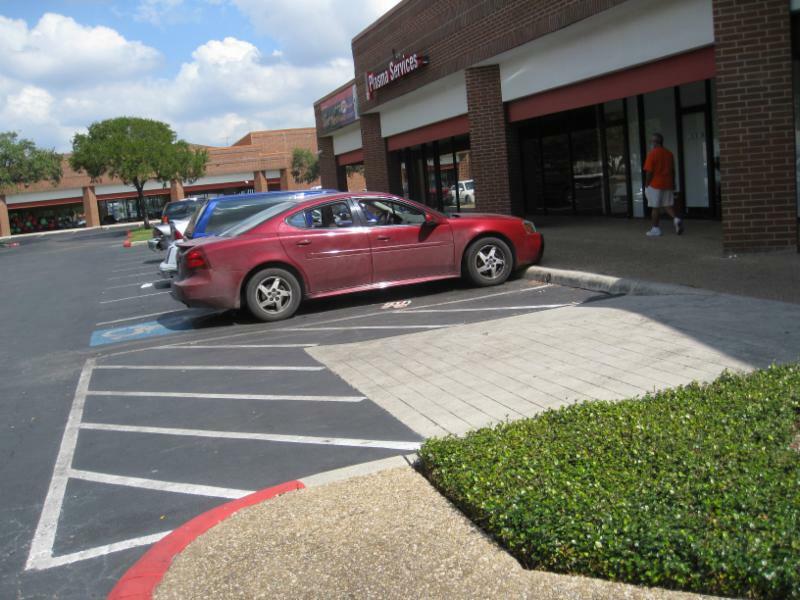 What prevents businesses from making the changes that make their businesses handicap accessible has many parts. 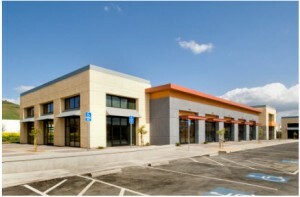 Many business owners tell me it’s about money and construction cost — a big investment without any financial return. I do understand that no one likes to spend money on things they don’t believe necessary to operate their business, but what if it turns out to be good business? Sometimes events occur that help to illustrate the value of consulting with an accessibility design professional to bring your business into compliance with the accessibility codes and the Americans with Disabilities Act (ADA) requirements. 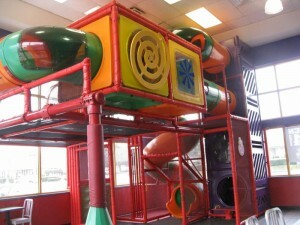 I recently had a project that involved ADA upgrades to a long established restaurant. This particular project was not that much different than many of the other projects that I had designed in the past, with one exception…. It was severely damaged by fire and was over 140 years old. It was damaged, but not destroyed. The beloved building would be repaired and rebuilt. Whenever there is a fire in a building, it is a tragedy. If the building is 140 years old and has a fire, it is a serious tragedy. Buildings like that are vital to the heritage of their community. Having something as permanent as a beloved local building damaged by fire can be extremely unsettling for many people. After I saw the damage and got over my personal shock, I comforted the owners, “don’t worry,” I said, “the structural damage can be repaired.” I then began to contemplate the task at hand. 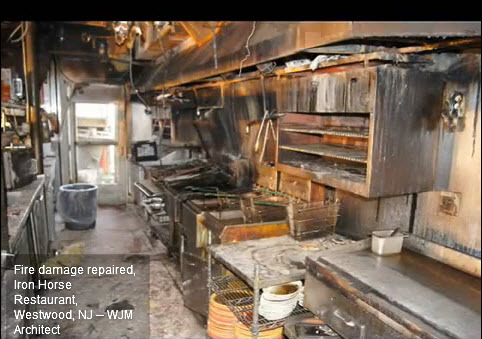 My client would have loved to blink his eyes and have everything put back exactly as it was before the fire. However, the extent of the damage was more than sufficient to require building code upgrades, including accessibility upgrades. 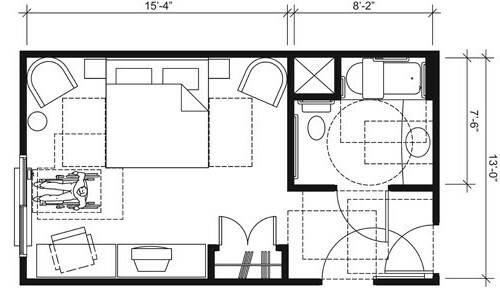 The multilevel interior dining rooms would have to change. Toilet facilities would have to be addressed. After assisting in obtaining the cleanup and selective demolition permit, the very next thing I did was to prepare a comprehensive building code analysis to identify the exact upgrades that would be required based on the extent of the damage. This had to be done first, since it affected the overall approach to the fire damage repair and rebuild design work. I met with the building officials and had them review and sign off on the code analysis and required upgrades. This way I had a clear and unchanging set of requirements specific to this project. The full extent of required upgrades were established and I could now begin the redesign work. This was a normal reaction from a very savvy businessman assessing a difficult situation. 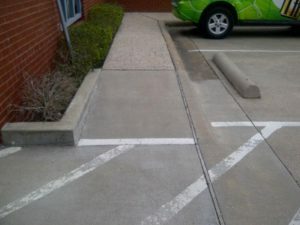 For an accessibility design professional , this was a design problem to be solved. Armed with my ADA/ANSI code analysis, I began to look for solutions. The dining rooms were 2 steps up and down from one another. It seemed like there were steps everywhere. The ladies toilet rooms were on the second floor, a full flight of stairs up from the dining rooms. The mens toilet room was actually 2 small individual toilet rooms just off the dining room. 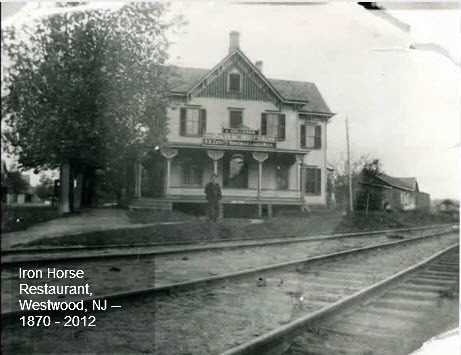 The 140 year old wood framed building had been a Victorian house, a hotel, rooming house, bar, and finally, most recently, the fire damaged restaurant. 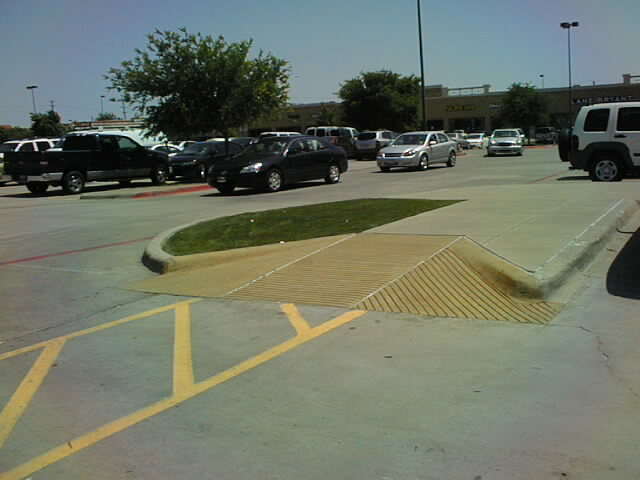 Built right up to the street line, there was no front yard for any kind of ramp. The main building had long ago been connected and combined with the buildings next door. 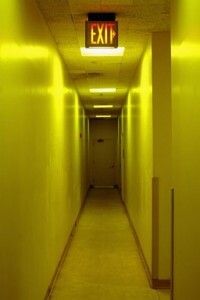 These connected buildings were why every floor was at a different level. 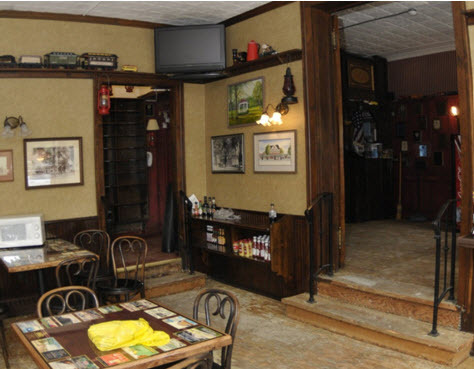 They were built as separate buildings and combined later into the dining rooms, kitchen and bar of the restaurant. 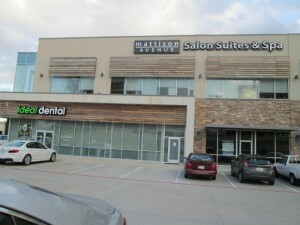 The old connected storefront was previously converted into an emergency exit and alarmed to prevent casual use. 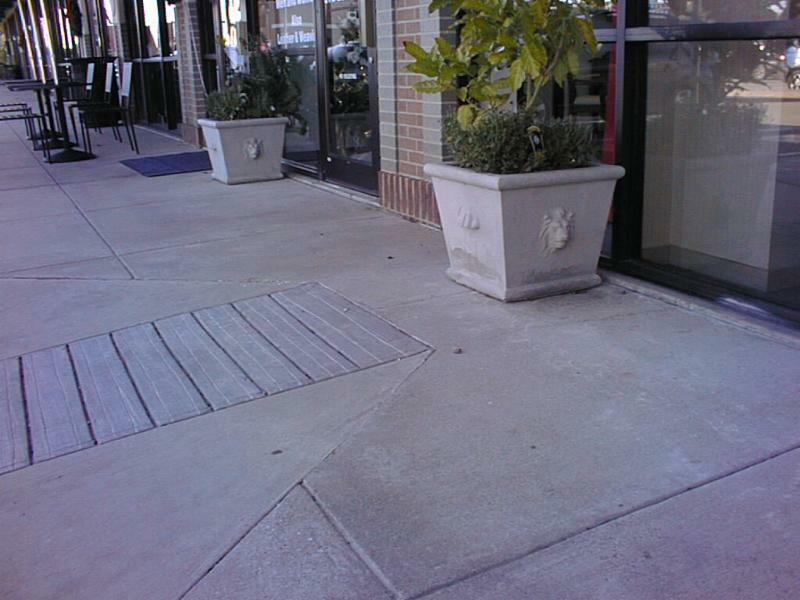 Even though there was a step to the doorway, the recess of the storefront allowed for a ramp to meet the sidewalk. 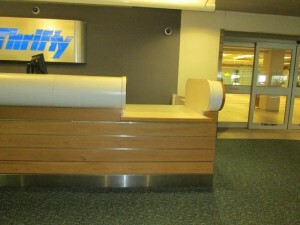 There was my new accessible entry. The four steps up at the existing traditional entry could remain as I designed this entry adjacent to serve as a new ramped entry. 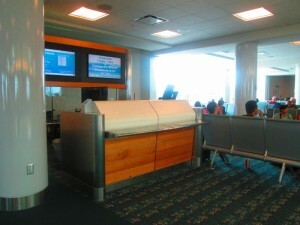 There were no tables allowed in front of this emergency exit, so no tables and chairs were affected by this change. Next the dining room levels had to be addressed. 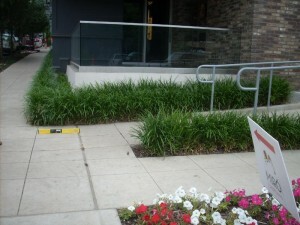 I could get a ramp in from outside, but now I had to find an accessible route within the space. 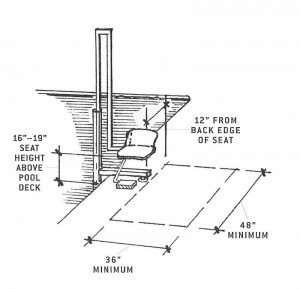 The 14 inch difference between floor levels meant a 14 foot long ramp in the dining rooms with landing space, railings, turning clearances, etc. This would certainly affect tables and chairs in the dining rooms and this was what my client felt was devastating to his restaurant seat count. I began to get a headache. Since circulation space could also serve as ramp landing space, I analyzed the circulation around the tables and the kitchen area. The kitchen was also 2 steps higher than the dining room. The hallways connecting the dining rooms to the kitchen could not be used for tables regardless. 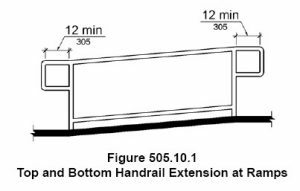 Instead of a single 14 foot long ramp, I designed two 7 foot ramp sections — one in each dining room using these existing hallways. 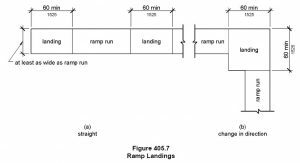 The two ramps met at a new mid level where I created a comfortable landing with proper turning radius. Kitchen entry was shifted over slightly. The fire had begun in the kitchen and this doorway move could be done easily during the kitchen redesign. 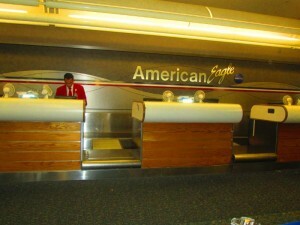 Adjacent to the new ramp landing space was a large storage closet where beverages were dispensed and glasses stored. I relocated the beverage function into the new efficient commercial kitchen design and used this closet space for a unisex accessible toilet room. I aligned the toilet room floor at the new landing mid level, with the door to the toilet room opening off the ramp landing. 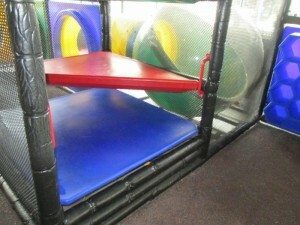 There was proper clearance for the ramps, turning, handrails, and the required toilet room door approach clearances. 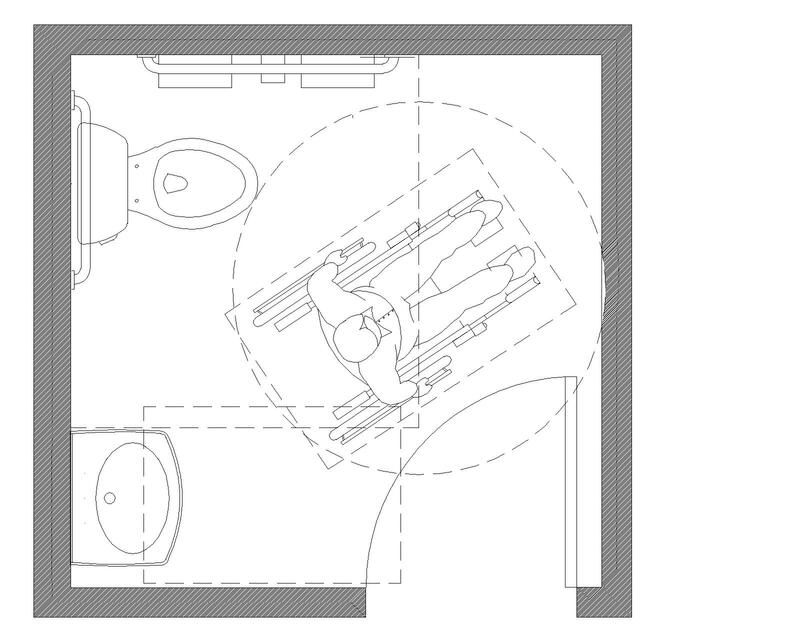 The closet interior was slightly larger than was needed for the a compliant toilet room. 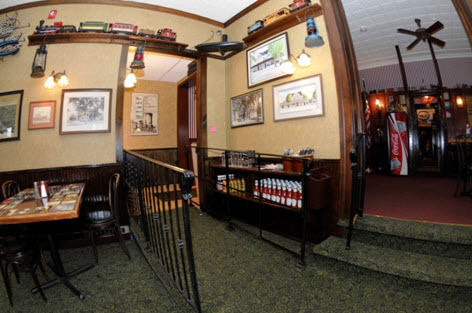 I now had the interior accessible route connecting the dining room levels and the required unisex handicap toilet room. 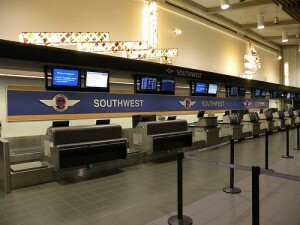 This was accomplished without displacing a single customer seat. 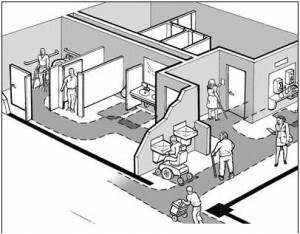 After I confirmed all of the many overlapping ADA clearance requirements, I grabbed my sketch and met with the owner to explain how it would work. At first he could not believe it. The ramps were much shorter than he was told would be necessary. When I explained the new mid level between the two ramps, his eyes grew big as he realized that it was possible after all. 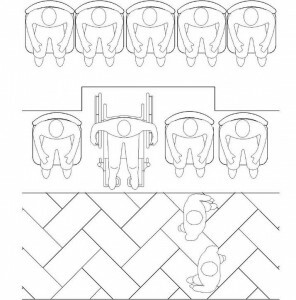 Nearly any building can be made accessible, it’s really a matter of architectural creativity and open minded problem solving. 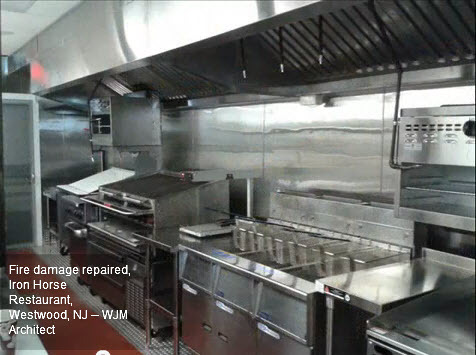 The fire damaged restaurant, with the handicap accessibility changes, was completed and re-opened. Like any beloved neighborhood business, the outpouring of public support resulted in increased business in the weeks and months since the re-opening. 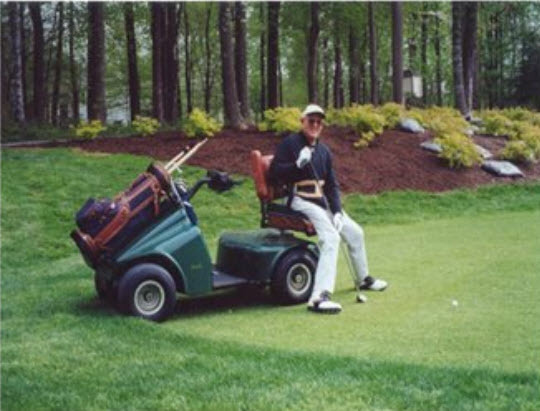 I suggested to the owner that they include in their advertising a few words about the new accessible features. The result has been a sustained increase in their business. Able bodied people now bring disabled relatives to eat. More elderly patrons, many with only minor mobility issues, now flock in groups to enjoy the best burgers around. Some people come just to see the inside of the 140 year old building. They never thought they would be able move freely between the levels and now they come just because they can. Accessibility professionals know that making your business accessible isn’t just part of the building code, it’s good for your business. 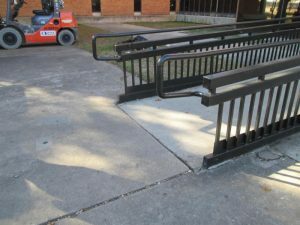 Over the years I have assisted businesses and witnessed them benefit substantially from handicap accessible modifications made to their buildings, especially service businesses. 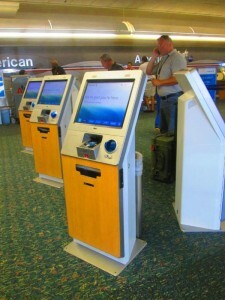 Accessibility for all is good business. 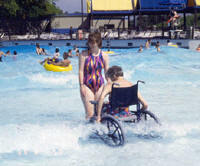 The 2010 ADA Standards require that swimming pools, wading pools and spas be made accessible to the disabled community. 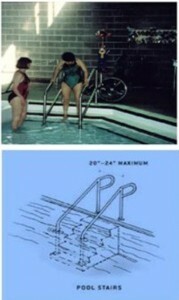 Existing pools also have to comply , but the Department of Justice allows that to happen “as it is readily achievable”. This newsletter explains what the requirements are and what the deadlines to comply will be. 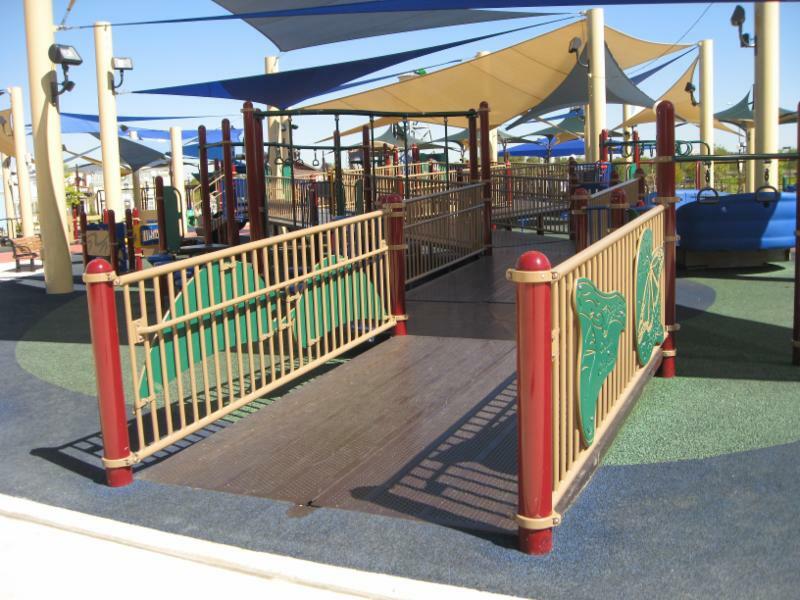 They are just like ramps, but do not require slip resistant surface or handrail extensions. 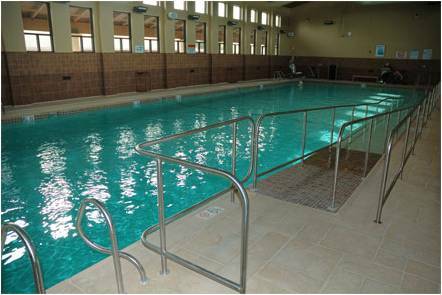 For existing facilities with swimming pools, what this means is that the means of entry should be provided if there is enough money and if it does not cause undue burden for the building owner. These terms are very subjective and they must be backed up with financial proof. Many members of the hospitality industry were concerned about these new requirements, and therefore the DOJ gave an extension until May 15th to comply with these requirements. My colleague Ken Otten wrote a great blog about it. I recommend that you read it to gain a better understanding of this ruling. 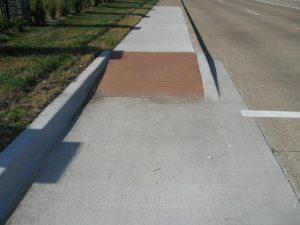 Because at the end of this week on March 15th the 2010 ADA Standards and the 2012 Texas Accessibility Standards are becoming mandatory, my March has become a frenzy! Most of my clients are scared about the new requirements and want me to come and teach them everything they have to know to not get in trouble. Someone actually said that the new ADA regulations is worse than communism. I am assuming they meant that they felt as if the DOJ was like the KGB getting anyone who still has the wrong door hardware on doors! I am sure that the DOJ is not out to get anyone (but I could be wrong). 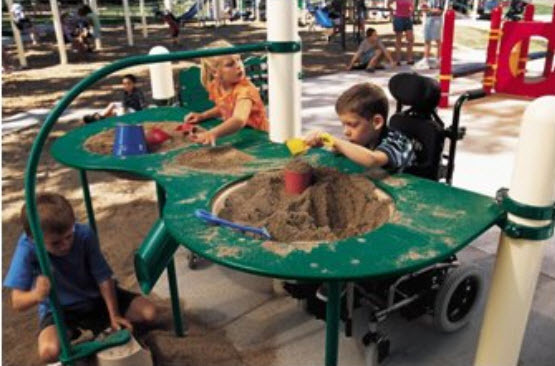 What we have to keep in mind is that we are making great strides to allow the disabled community to participate independently in every day activities. 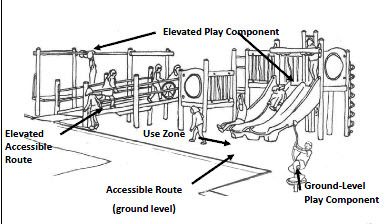 The design requirements for assembly areas have been revised to provide more specific guidance about the appropriate vertical and horizontal dispersion of accessible seating, sightlines over standing spectators, and the provision of companion seating. 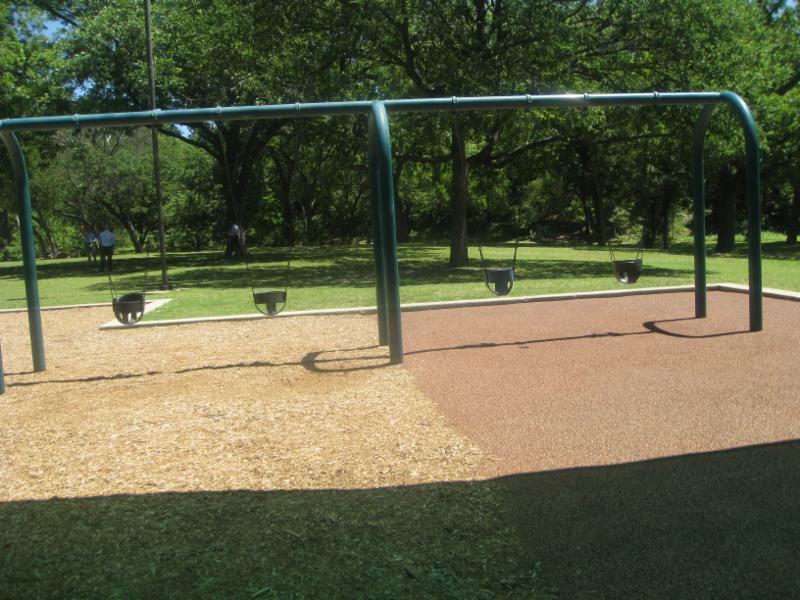 In addition, lawn seating areas and exterior overflow areas without fixed seats must now connect to an accessible route. The scoping of seating in large facilities has been reduced. The incremental scoping for wheelchair spaces and companion seats required in assembly areas with fixed seating has been reduced. 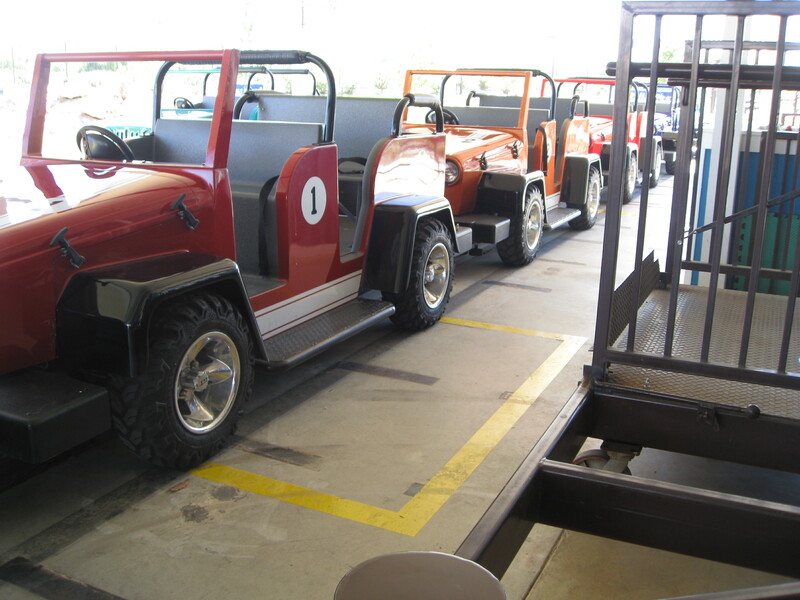 Under the 1991 Standards, incremental scoping for assembly facilities with more than 500 seats was one additional wheelchair space and companion seat for each increase of 100 seats. 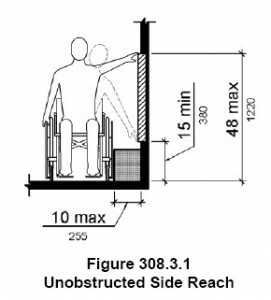 Under the 2010 Standards, facilities with 501 to 5000 seats must provide one additional wheelchair space for each additional 150 seats (or fraction thereof) and facilities with more than 5001 seats must one additional space for each 200 seats over 5001. 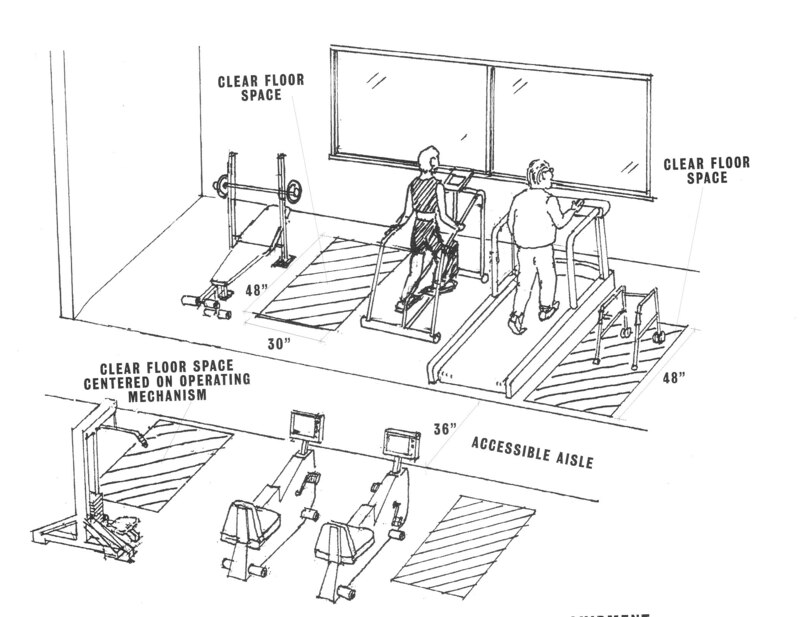 Under the 1991 Standards, it was necessary to design work areas to permit an employee using a wheelchair to approach, enter, and exit the area. Under the 2010 Standards, it will be necessary for new or altered work areas to include accessible common use circulation paths within employee work areas, subject to certain specified exceptions. 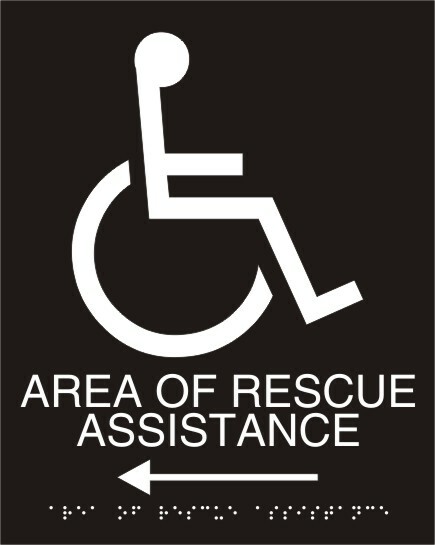 All accessible routes connecting site arrival points and accessible building entrances now must coincide with or be located in the same general area as general circulation paths. Also, where a circulation path is interior, the required accessible route must also be located in the interior of the facility. 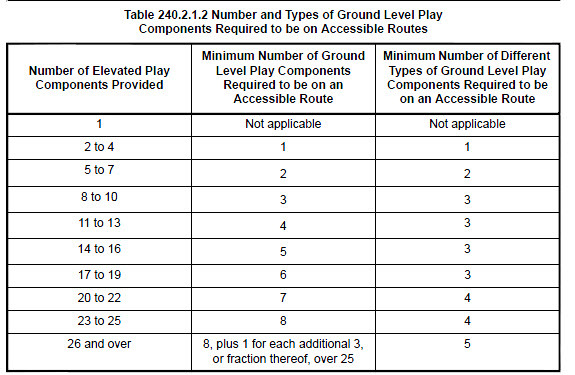 In situations where a circulation path directly connects a seating area and a stage (either a permanent or temporary stage), both title II and title III entities must now provide an accessible route that directly connects the accessible seating and the stage. 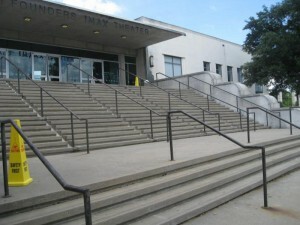 However, where a direct circulation path from the seating area to the stage does not exist, a direct accessible route need not be constructed. 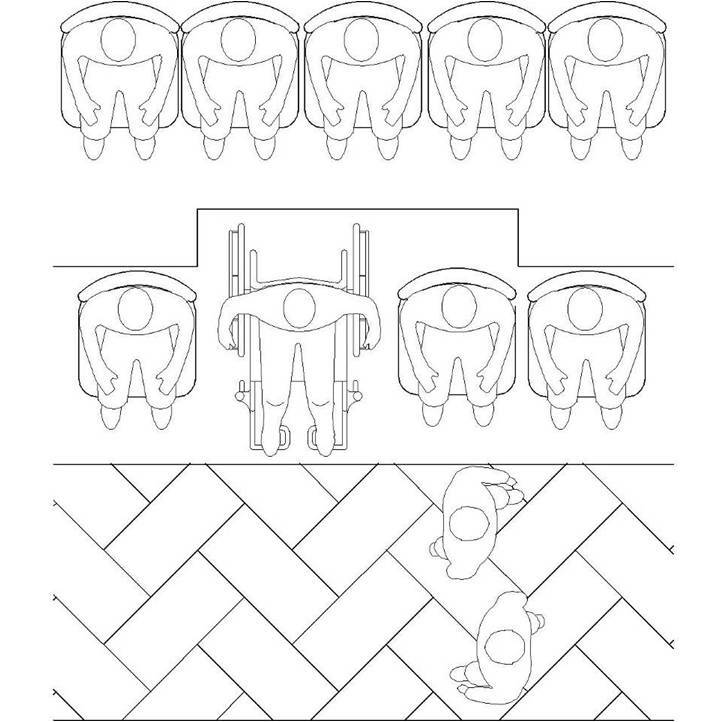 This provision is in addition to the pre-existing requirement to provide an accessible route to connect the accessible seating and the stage and other ancillary spaces used by performers. 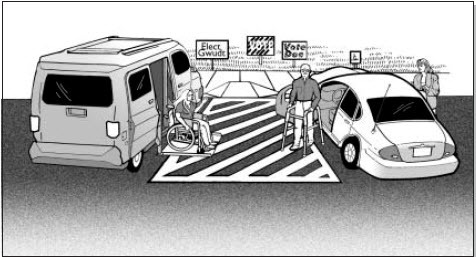 Where levels in a parking garage have direct connections for pedestrians to another facility, all of these direct entrances must now be accessible. 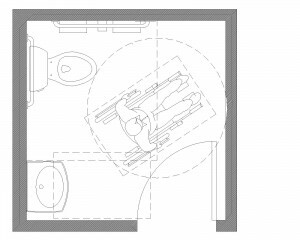 Overall scoping for guest rooms with accessibility features is unchanged, but the rules now limit the number of rooms where both communication access and mobility access features are provided. No more than 10% of the guest rooms (but not less than one room) required to provide mobility features may also be equipped with communication features. In addition, guest rooms with mobility features and guest rooms with communication features must be dispersed among the various classes of guest rooms, and shall provide choices of types of guest rooms, number of beds, and other amenities comparable to the choices provided to other guests. When the minimum number of guest rooms required is not sufficient to allow for complete dispersion, guest rooms must be dispersed in the following order – guest room type, number of beds, and amenities. 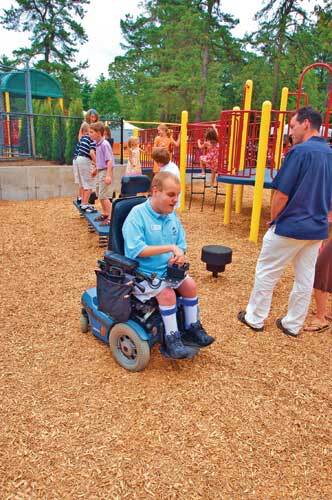 Many newly designed or newly constructed amusement rides must be accessible and located on an accessible route to the ride. 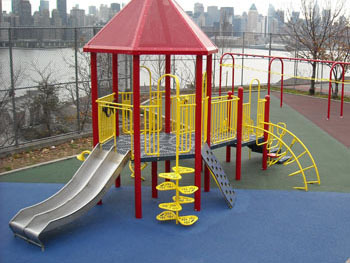 However, amusement rides designed primarily for children, amusement rides that are controlled or operated by the rider (e.g., bumper cars), and amusement rides without seats, are not required to provide wheelchair spaces, transfer seats, or transfer systems, and need not meet signage requirements. 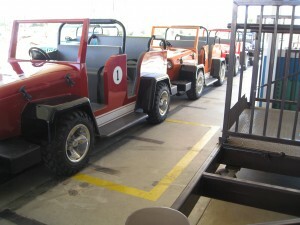 That said, these rides must be on an accessible route and must provide appropriate clear space. 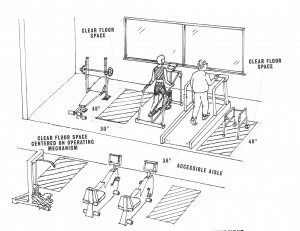 At least one of each type of exercise equipment must be on an accessible route and must have a clear floor space positioned to enable an individual with a disability to use the equipment. 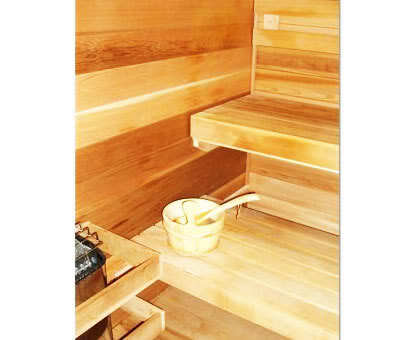 Where provided, saunas and steam rooms must be accessible, having appropriate turning space, doors that do not swing into the clear floor space, and, where provided, an accessible bench. 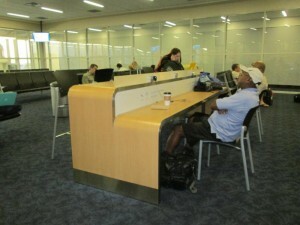 A readily removable bench is permitted to obstruct the turning space and the clear floor space. At least one of each type of general holding cells, general housing cells, medical care facilities, and visiting areas must be accessible. 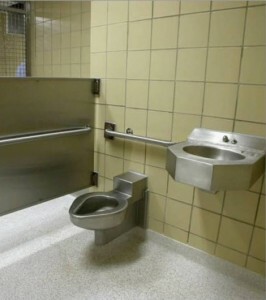 In addition, at least one of each type of special holding cells or special housing cells also must be accessible. Also, at least one of each type of central holding cells, court-floor holding cells, and visiting areas in a judicial facility must be accessible. Each courtroom must be accessible. Jury boxes, witness stands, and jury deliberation areas must be accessible. 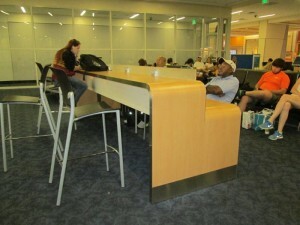 Judges benches and other employee work stations must be accessible, but raised courtroom work stations are not required to provide ramps or lifts at the time of construction as long as the space has been designed to permit the future addition of a ramp or lift without substantial reconstruction. This section establishes requirements for dwelling units provided by public entities subject to title II. For residential units that are also subject to the section 504 regulations of the Department of Housing and Urban Development, the standards defer to the HUD regulation for the scoping requirements. 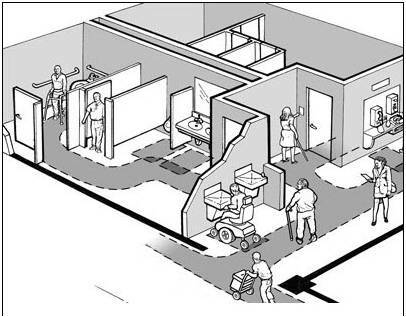 For all other units, at least 5% must be accessible to individuals with mobility impairments. 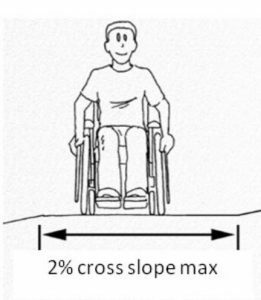 In addition, at least 2% must be accessible to individuals with communications related disabilities. For more information: The final rule and this fact sheet are available in electronic format on the Internet at http://www.ada.gov/. 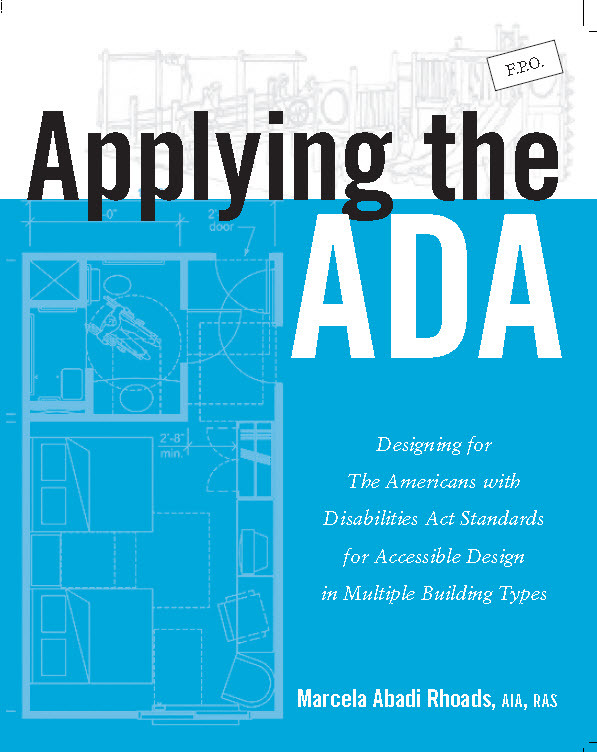 For additional information or to order copies of any documents, call the ADA Information Line (800) 514-0301 (voice) or (800) 514-0383 (TTY). Copies will be available in accessible formats.